LFK's Jeff Laxier demonstrates a whitewater kayak boof stroke in the ocean. On calm days, kayaking Mendocino sea caves is amazing. LFK's Cate Hawthorne gets a nice pour over ride in her whitewater kayak. Willing to play hard and get wet? Experience a 3 hour playful exploration of the Mendocino Coast enjoying areas only accessible by kayak. We show you all the tricks you need to kayak and play in the waves and rock gardens and share with you the wildlife and incredible beauty of the Mendocino Coast. Liquid Fusion Kayaking's Whitewater of the Sea Adventure is a 3 hour wet and wild ocean kayak adventure. Each trip is unique based on the ocean conditions and the adventure level of the participants. On this trip, you can expect to play in waves, whitewater, and rock gardens. If ocean conditions permit, we will kayak into sea caves. Participants must be at least 14 years of age, in good physical condition, and able to swim. No previous kayak experience is necessary. Group sizes are small so that we can customize the adventure and maximize the fun. For a completely customized trip, you can book this adventure as a private event. 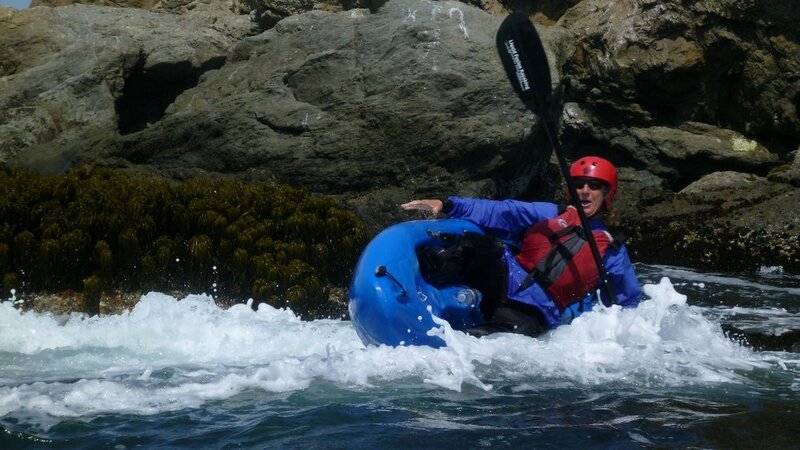 Whitewater of the Sea is available Mid-May through Labor Day and is $100/person (all equipment provided).